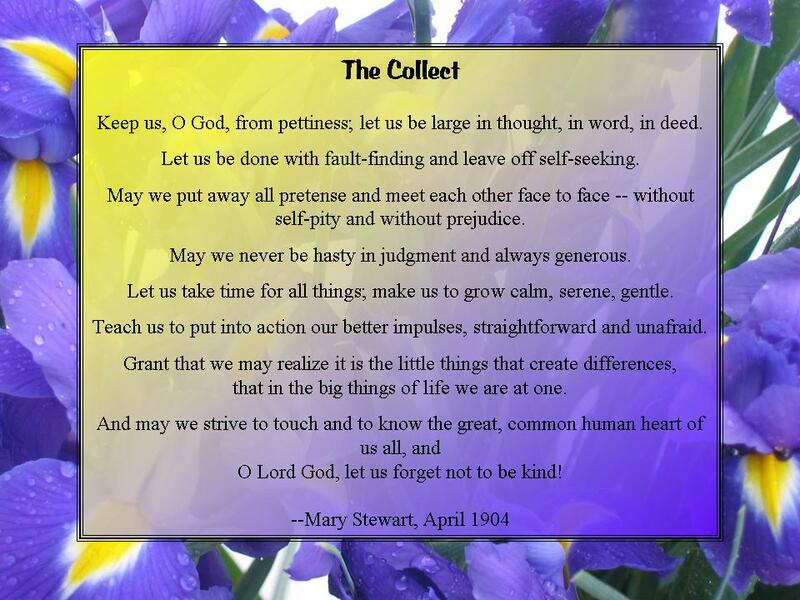 Mary Stewart wrote the collect in 1904 as a member of the Fortnightly Clubs, the forerunner of the Longmont, Colorado BPW Club. The collect was written as a prayer to instill a sense of unity among women working together with wide interests and important goals. Mary Stewart worked for womenʼs suffrage nationally and attended the meeting in St. Louis in 1919 at which the national federation was launched. She was elected its first corresponding secretary and thereafter took an active part in the growth of the young organization by service as chairman or member of a number of national committees. The collect was reprinted in many forms around the world. Miss Stewart, who until 1910 signed the collect with her pen name, “Mary Stuart,” remained involved in BPW until her death in 1943.